We had a great week at Openstack Summit in Portland. See the article in Wired magazine for a short summary. Or watch the Best Buy Openstack keynote. One thing I learned from three days at the Openstack Summit is that I have always misconstrued the definition of Hybrid cloud architecture. When we started making plans for our cloud architecture, I always thought of it as a Hybrid cloud. At Openstack, there were numerous presentation on Hybrid cloud and all of them revolved around using the cloud to provide additional scaling for an application that runs in the datacenter. 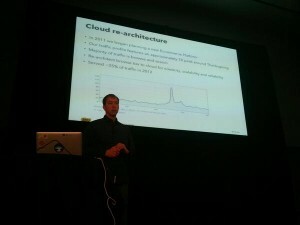 In all cases, the datacenter architecture stack was simply recreated in the cloud and used for peak load. The database master is in the datacenter and a slave exists in the cloud. The Hybrid cloud architecture simply means using a cloud to elastically horizontally scale an existing application. When I originally thought about Hybrid cloud I thought of an application that has one or more layers in the cloud, and the remaining layers in the datacenter. I now call this a Layered Cloud architecture. In our case we built our new product browse capability in the cloud and kept the remaining application in the datacenter. All the data in the cloud was non-secure, basically public data so there was little to no security issues. We are keeping the commerce pipeline in the datacenter simply because it is easier to keep the commerce data and transactions in our secure datacenter. This is a good example of assumptions clouding my view of reality. I’ve read plenty of articles and information about Hybrid cloud, but until I was sitting in a presentation having someone tell me about Hybrid cloud, I never noticed my definition was incorrect. Than after recognizing this, I watched every presentation to determine which definition was used more frequently. Unfortunately for me, all the definitions were the same and they did not support my original view.